Takeaway: The increased number of techniques improves the details, integrity and confidence of the data relating to the corrosion rate and causes. A multi-technique corrosion monitoring system combines two or more techniques to cover a wide base for data gathering and to provide accurate corrosion data as well as differentiate between localized and uniform corrosion. The approach overcomes the limitations of the individual monitoring techniques, and helps in identifying the various complex factors that often lead to corrosion failures. The corrosion-related failures in pipelines cost billions of dollars in production losses, downtime, environmental contamination, injuries and fatalities. Most of these could be significantly reduced by employing continuous monitoring techniques as a component of comprehensive corrosion control programs. The monitoring enables the detection of changes in the rate of corrosion as well as the variations in corrosion behavior. This information enables timely remedial action to be applied and hence eliminate the corrosion-related failures. Using more than one type of a monitoring system provides more accurate data that can reliably determine the corrosion rates as well as the effectiveness of the control and protection methods in place. Individual corrosion monitoring techniques used in isolation will only give an indication of one type of corrosion and may not show another form even if it exists. This can be misleading and shows that there is no corrosion when, in fact, another type of corrosion process is taking place. The multi-technique approach combines various complimentary technologies to provide maximum coverage and to overcome the limitations of relying solely on data from an individual technique. In addition, some of these additional techniques allow the systems to differentiate between general and localized corrosion processes. The data from such a combined system is more reliable in identifying a suitable inhibitor for the localized corrosion, thereby helping in the fight against corrosion and providing economic benefits to businesses and the users. LPR/HS-ER provides data within minutes if set up correctly and then interrogated online. ER can provided the data after a few days or weeks if the detected corrosion rate is rapid. Corrosion coupons provide data over long periods (in terms of weeks or months). Corrosion monitoring includes the use of a broad range of techniques to evaluate the degradation of pipes, plants and other metallic materials. These fall into two distinct groups, namely those that provide indications of the prevailing corrosion rate and those that indicate the cumulative damage. These tests are usually online and continuous. They include linear polarization resistance (LPR), electrochemical noise (ECN) and harmonic distortion analysis (HDA). The techniques, which provide a shorter response time and high resolution, are designed to provide faster assessment of the rate of the electrochemical processes at the metal-interface environments. The techniques will usually give results within a few minutes. These include the weight loss coupons, ultrasonic thickness (UT), ER, radiography and other non-destructive methods. However, these will only show signs of change after sufficient corrosion has taken place to cause damage in the material. These are often offline, do not provide real-time data, and the measurement cycles run into several days or weeks. Improvements in automated, multi-technique systems allow the combination of multiple measurements into a single instrument. One of the commonly used methods uses LPR in combination with two or more quantitative techniques such as ECN and HAD. As an example, the combination of the three complimentary techniques of HDA, LPR and ECN is used in water cooling systems to provide accurate corrosion rate estimates, an indication of whether there is localized corrosion. The combination also gives an assessment of how the corrosion mechanism is influenced by the presence of scales or films, or by the loss of protection or passivity on the metal surface. The use of the ECN and LPR rates with B correction from the harmonic distortion analysis makes it possible to make quantitative measurements. There are several other combinations that use different techniques depending on the application and environment. Electrochemical techniques are widely used in multi-techniques corrosion monitoring. This is due to their sensitivity and speed, which allow correlation of the changes either in the corrosion mechanism or the rate that occurs from even the small, short-term variations in the corrosion or process control. For example, the monitoring is able to detect the impact of ingress of oxygen caused by the temporary opening of the valve or loss of chemical delivery in a water system. The instruments use between two and four different techniques depending on the application, and adding different sensor elements enable them to simultaneously apply multiple techniques at the test location. A common combination used for various tests includes LPR, HDA and ECN monitoring probes. This is used to monitor both the localized and general corrosion in water injection systems, in multi-phase oil-water systems with corrosive gases, the oil refining industry, natural gas transmission pipelines and more. The real-time, online systems provide corrosion data quickly and some at intervals of less than 10 minutes. This provides engineers and plant operators with the relevant and accurate data that helps to improve equipment availability, reliability and integrity. 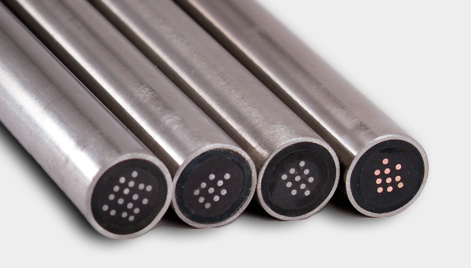 Potential measurement: A platinum wire works as the reference electrode to give indications of changes in a potential while an Alloy 690 coupon works as the working electrode. Zero resistance ammetry (ZRA) determines the galvanic current between two dissimilar electrodes. Electrochemical potential noise (EPN) determines fluctuations in potential during corrosion. Electrochemical current noise (ECN) determines the fluctuation in current during the corrosion process. The EPN and ECN data is used to identify the corrosion mechanism. This is done by comparing the data with the signatures of the pitting corrosion and the stress corrosion cracking. In addition, the ECN data is also used to determine the overall corrosion rate. A combination of techniques maximizes the number of parameters that can be monitored, while minimizing the limitations of individual monitoring techniques when used in isolation. The increased number of techniques improves the details, integrity and confidence of the data relating to the corrosion rate and causes. This provides valuable information that can help fight against corrosion and provide an economic benefit to businesses, operators, engineers and users.